In December 1990 the Dream Factory got back for a highly improbable reunion gig at The Rathole with Love On Board (another reunion!). It was quite amazing to get so many of the band back together and it was great fun. 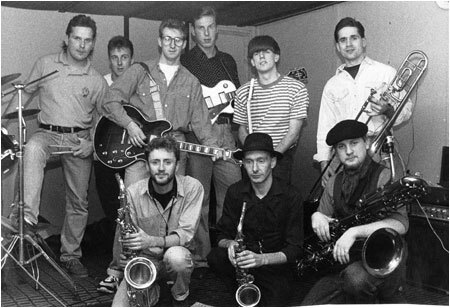 The photograph below shows the briefly reunited Dream Factory at the rehearsal room at the Freasley scrap yard on December 4th, 1990. LEFT TO RIGHT: Rear: Andy "Batman" Holt - Drums, Lloyd Barnett (guitar, vocals), Tim Goode (holding guitar) (lead vocals), Dave Stevenson (lead guitar, backing vocals), Mark Mortimer (bass, backing vocals), Paul Stansfield (tenor trombone).